No restrictions, everyone can register .SE domain names. Is local company in Sweden required? Anyone can register any amount of domain names. It is however required that each registrant supply the Registry with an ID number. Business registrants will be required to supply the company registration number, whereas private registrants must supply either their social security number, ID card or passport number or the equivalent. Companies based within the European Union must also supply a valid EU VAT number. Is local admin contact in Sweden required? No, a local administrative contact in Sweden is not required in order to register .SE domain names. Are trademarks usable in Sweden? Trademarks are not required for .se. It is however also possible to register a trademark under the designated second level TLD tm.se. Are generic domains allowed for .SE? No restrictions. The registry has a list of geographic, political and other names which are blocked/reserved and therefore cannot be registered. How much time does it take to register .SE domain name? Usually, it takes 1 day/s to register a .SE domain name in Sweden. We will file the application as soon as possible. However, we cannot provide guarantees as we have no influence on the speed of the Swedish domain authority once the application has been filed. What is the minimum of characters allowed for .SE domains? It is not possible to apply for .SE domain names with less than 3 characters. What is the maximum of characters allowed for .SE domains? It is not possible to apply for .SE domain names with more than 63 characters. Can I register more than one Swedish domain name? Applicants may register an unlimited amount of Swedish .SE domain names. There is no need to configure your Domain Name Server in advance for .SE domain name. Are there other domain extensions related to Sweden? 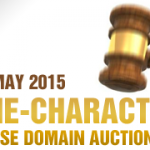 The Swedish Domain Authority allows to register .SE domain names consisting of only one character starting 27 May. Domain name .SE in Sweden. Available for registration. Accepted payment methods for .SE domain names include Visa, Master Card, JCB, DanKort, PayPal, Visa Electron, Maestro, UnionPay, American Express, and wire transfer.